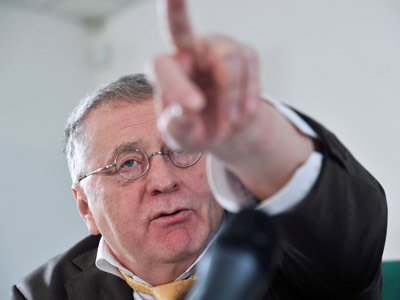 Veteran Russian politician Vladimir Zhirinovsky spoke before supporters in central Moscow and promised that if he wins the elections, his competitor Mikhail Prokhorov will be put in prison, along with many other businessmen and politicians. 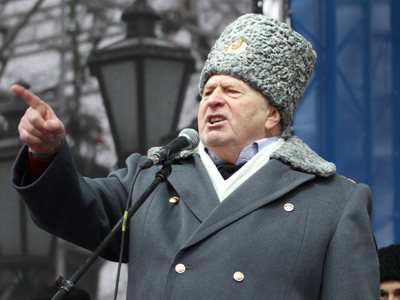 The pro-Zhirinovsky rally was attended by about 1,500 people, according to police reports. Zhirinovsky, dressed in the full army colonel’s uniform (presumably due to the fact that Russia is celebrating Defenders of the Motherland Day) spoke for almost one hour and concentrated on the necessity to protect Russia from internal and external enemies. The politician said that the threat of war in Iran is very high and if it unfolds it will also fire the old conflicts in the Caucasus and Russia will need all its strength to protect its borders, even though, Zhirinovsky stressed, there was no need to get involved in an actual military conflict. He also estimated the start of the new war as Summer 2012 and suggested to speed up the inauguration of the president-elect by one month so that the nation is not distracted by procedures when the times get hard. Besides, Zhirinovsky announced that if he wins the election, billionaire businessman and independent presidential candidate Mikhail Prokhorov will be put “where [jailed businessman Mikhail] Khodorkovsky is” before May 1. Zhirinovsky directly accused Prokhorov of splitting the Norilsk mining combine into parts, selling the assets and transferring the cash to offshore companies. 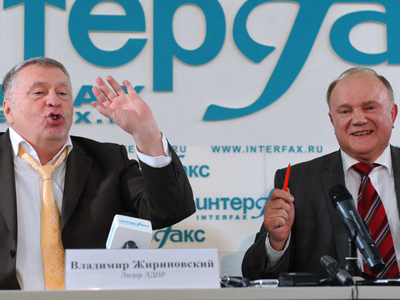 “Those who steal from us – Chubais, Gaidar, Prokhorov – we will make short work of them without mercy,” Zhirinovsky said, putting his opponent in line with the mastermind of the Russian economic reforms of the 1990s, Anatoly Chubais and the late economist Yegor Gaidar, who headed Yeltsin’s government when these reforms were carried out. 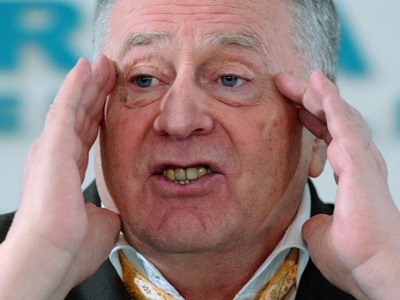 A seasoned master of populist rhetoric, Zhirinovsky assured the public that their living conditions would improve fast once he heads the country. “I am the most experienced, the most courageous and resolute. 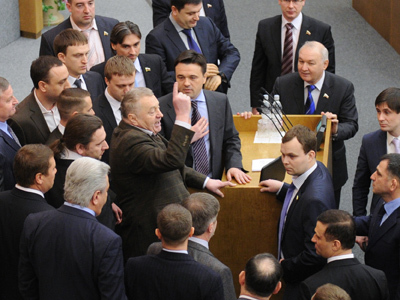 Not only does the whole country know me, but the whole world,” Zhirinovsky said.